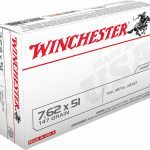 Back in January of 2016, the U.S. Army awarded Winchester a $22,829,590 fixed-price-economic price adjustment contract with options for 5.56mm, 7.62mm, and .50 caliber ammunition. Late last week, the Army gave the Illinois-based Winchester a $8,129,222 modified order under that existing “Second Source” contract for 7.62mm ammunition. Under the terms of the deal, the ammunition will be manufactured in Winchester’s Oxford, Miss. facility. The estimated completion date for the work is Dec. 31, 2019. Winchester has received over $285 million in orders on this contract since it was first awarded in January 2016. “Winchester has a proud history of developing products for the military and is honored to have a role in supporting the American war fighter with the ammunition they depend on,” Matt Campbell, Winchester’s VP of marketing and sales, said in a statement. Olin Corp. – Winchester Division, East Alton, Illinois, was awarded an $8,129,222 modification (P00029) to contract W52P1J-16-C-0003 for 7.62mm small caliber cartridges. Work will be performed in Oxford, Mississippi, with an estimated completion date of Dec. 31, 2019. Fiscal 2016 and 2018 other procurement, Army funds in the amount of $8,129,222 were obligated at the time of the award. U.S. Army Contracting Command, Rock Island Arsenal, Illinois, is the contracting activity. It’s been a healthy couple of years for Winchester. In January, the iconic brand was awarded a $16 million contract to be the FBI‘s primary source of .40 S&W pistol ammunition. This includes a 180gr bonded jacketed hollow point (JHP) service cartridge. Full metal jacket (FMJ) and frangible training loads are also being provided. Meanwhile, the company’s M1152 Ball and M1153 Jacketed Hollow Point (Special Purpose) ammunition are feeding the Army’s M17 and M18 pistols. You see, the $580 million contract awarded to SIG as the winner of the MHS competition included not only the gun, but also accessories and ammunition. Guess which company SIG partnered with on the ammunition? The good times keep on rolling for Winchester.